I graduated with an ADN in 2013, I had a hard time passing NCLEX. I finally passed my NCLEX with 75 questions in 2017, that means a 4-year gap from graduation to NCLEX. It did not look good on my resume. Since March 2017. I had a total of 3 nursing jobs. I did not have the best luck in those jobs. The first one was as a hospice nurse. I was not getting paid due to their finances and the company closed down. I only worked there for 1 month. The last 2 were nursing homes; I had to quit my last job, because a CNA got verbally aggressive towards me, and I was 3-4 months pregnant at the time. CNA kept on altering residents by yelling loud down the hall, DON was present did not do anything to resolve the problem. I was very calm during this altercation, I wanted my residents to be stress-free, but I was having horrible abdominal cramps. I was very concerned about my baby at the time, but I also needed to continue my shift, when I got home I noticed a small amount of vaginal bleeding. I went to the doctor the next day, she said that it was probably the stress, but the baby was fine. I talked to the DON, I asked if there was going to be disciplinary action towards CNA. DON answer was that I could be moved to a different unit in the nursing home. I did not want to leave my residents, I wanted to stay in my unit. DON wanted to move me to different units in order to keep that CNA in the unit that I was working. No disciplinary action against the CNA, just rumors at the facility that I was scared of the CNA. I hadresignedwithout a notice. The last words of the DON were; "so you are quitting because of a CNA", I told her that I had to keep my baby safe. I struggled with fertility, I had to go through different rounds of fertility treatments for 4 years and I was not going to let anybody harm my baby. Now I am 24 weeks, I have been without a job for 2 months. I have applied to a large number of facilities, but nobody calls me for interviews and if I get the opportunity to interview I do not get the job. I do not know why; probably the pregnancy, the fact that it took me a while to pass my NCLEX and the very little experience. I am very worried because my due date is in November. I really need a job, I notice that I am starting to get more tired. My due date is the second week in November 2018, then I have to stay home for sure at least 1-2 months with my baby. February 2019 is the next time I can start working as a nurse, but by then I am going to have a7-month gap. I know I will be struggling to get a job. Please help, any advice is very appreciated it. I really do not know what to do at this time. You've had 3 nursing jobs in a little over a year, and you quit your last job while you were pregnant. Now you are 24 weeks pregnant and probably showing. When you quit your last job while pregnant, what was your plan? It's too late now, but it sounds like the DON was trying to work with you by offering to place you in another unit. You may have been right believing the CNA should have been disciplined, but being right doesn't help when you're out of a job. It's going to be very hard landing a job when you're pregnant. Technically, employers cannot discriminate, but discrimination is hard to prove. You may have to wait and essentially start over in Feb 2019. With perseverance, you will probably be able to land a job, although you will be asked about your work history and short tenure. You will have to convince any potential employer that you will not repeat your pattern of quitting. Once you land a job, you need to stay for at least one to two years to establish a stable work history. It is possible to run out of second chances. Very solid advice. You might also consider what you are going to say in an interview when the tough questions occur? Why did you have such a gap between graduation and NCLEX? It took me awhile to pass the NCLEX because I wanted to ensure I knew the material. I didn't quit and persevered and was successful. I can be successful at this job too. Why have you had so many jobs in such a short period of time? In retrospect, I realize that hospice is not my niche. The nursing home job came at a time when I was pregnant. I'm now ready to succeed and work hard at a full time job. Though an employer can't ask about daycare, your plans for future pregnancies, etc., you can bet that it would be to your advantage to somewhere state that your daycare is solid and you are now ready to fully devote yourself to your job. Best wishes. Please let us know how this turns out. Wait until you are ready to devote yourself to finding work and keeping a job. Face the problem at that time. Your energy level will be up and your ability to project a positive attitude should be greater. Until then, rest, and concentrate on the job at hand. However, most employers get around this by asking the person being interviewed to "tell me about yourself;" at which time many candidates provide much more information than they should. One needs to be cautious in how to answer this as the potential employer is free to consider any information they might be provided. Are there any part-time, per-diem, very short assignments that you can do now to flesh out your resume and garner references? I do not know what is available to an ADN. It is not flu season, but I was thinking of very short assignments, similar to giving flu shots. Every place I applied has a 90 day probationary period. If you got a job now, you might not make it though the 90 days because hiring is a slow process after interviews and background checks. Maybe do something else in the interim, like a temp position. I agree that the advice above is excellent. In addition to the short employment periods, the fact that you left without giving notice will be a hard thing to overcome. While I understand and am very sympathetic to why you did what you did, the fact is that employers will see "did not give notice" and immediately mark you down. When vetting applications, they do not always care about the "why" and often don't even ask. They just look at their criteria and sort accordingly. No, it's not fair. But when lots of applicants are applying for a position, they need to cull the herd down somehow. Since your pregnancy is rather advanced and has not been easy for you to come by in the first place, I'd focus on your pregnancy for right now, even if that means you forego a nursing job or take something temporary. You will probably have to follow Beth's advice and start fresh in 2019...and yes, have to convince them that what you did won't be an ongoing pattern in your employment. The last 2 were nursing homes, what happened at the non CNA issue one? Being pregnant is not stopping you from getting calls. Its the lack of experience on your resume. I think only having 3 jobs and them being such short time is affecting your experience. What jobs are you applying to? what specialties? I would consider going to a nursing staffing agency(not Travel) and working on that. You passed the NCLEX so thats not the issue. The issue is your work history as i know many amazing nurses who took more than one try to pass the NCLEX. I see some very good advice here. We all make poor career decisions sometimes. Have you considered using the time you have to be off work to take classes towards your BSN? Or take some classes that could help with supervising the CNA's that you will have to work with. It could give you more options when you apply for jobs. Or consider a physician's office or clinic. The hours would be better. Best of luck to you. Take care of yourself and the new baby. Other than the sound advice already given, might I suggest a refresher course? You have been out of school for a while and lack experience which is hindering you, along with being visibly pregnant. Since you've had a hard time conceiving, work on you and your baby's health first and foremost. Use the time off to establish a plan for success. a. Have a healthy baby. c. Backup childcare plan for appointments and/or sick days. 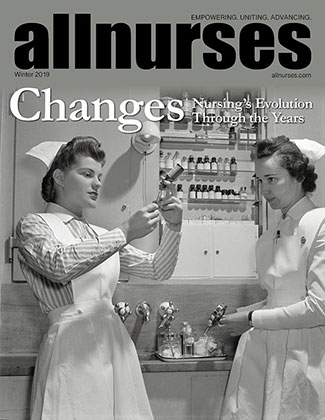 Nursing is forever changing so you need to be updated on a few things, also why inservices are necessary.